After four seasons in local Devonshire football, Exeter turned professional and were admitted to the Southern League in 1908, replacing Tottenham, who had been elected to the Football League. 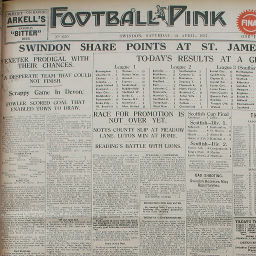 The Grecians struggled against Swindon's golden generation in their early meetings - the Town winning all five games played in their opening two seasons, scoring fourteen goals in the process - but City did the double over the Town in 1910/11, despite the Town winning the Southern League championship, and they also ended Swindon's defence of the Southern Charity Cup the following season. 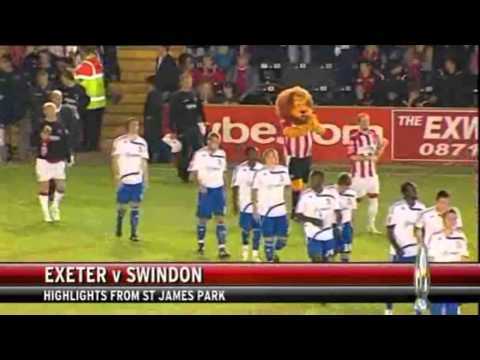 Both teams were elected to the League in the new Third Division in 1920, and both sides remained as members of this division until the Fourth Division was created in 1958, Exeter dropping down to the lower level while Swindon remained in the Third. 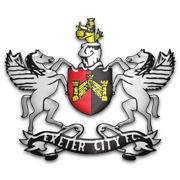 During this period, both sides registered their biggest victories over the other - Exeter beating the Town 5-0 in 1932, the Town winning 7-1 in 1949. Also, Swindon legend Harry Morris played his second match for the Town in 1926 against Exeter, and he netted his second hat-trick in a 4-2 win. Of the side that won promotion to the Premiership in 1993, two players originally came to the County Ground from Exeter - Lou Macari signed Martin Ling from the Grecians in 1986 for a fee of �25,000, though he played just twice before being sold to Southend, then bought back by Glenn Hoddle in 1991, and Town hero Shaun Taylor was Exeter's player of the year before Hoddle paid �200,000 for his services in the same year. An experiment with Sunday football sees a slight increase in attendance - and the crowd goes home happy, a last minute winner from Kevin Baddeley sealing a 3-2 victory. Swindon make it four 1-1 draws on the bounce - Kevin Amankwaah scores for the second consecutive game, but Exeter grab a late equaliser. Swindon concede a last minute leveller to take this Johnstone's Paint Trophy tie to penalties - but Exeter miss two in the shootout to send Town through. 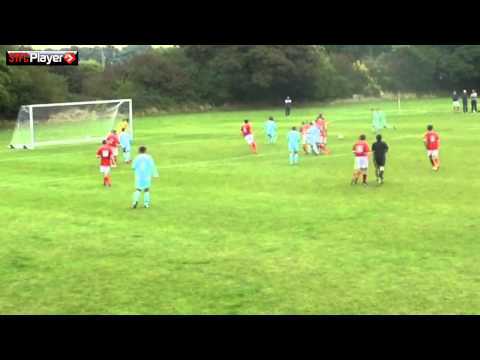 Despite dominating the game, Swindon only retrieve a point thanks to a late own goal in this televised encounter. 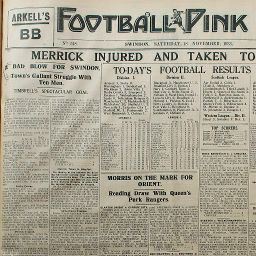 Click to view a newspaper report of Swindon's 1-5 defeat at Exeter City in the 1929-1930 season. 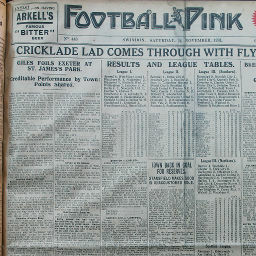 Click to view a newspaper report of Swindon's 1-0 win against Exeter City in the 1929-1930 season. 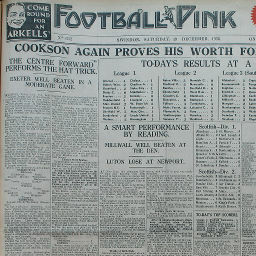 Click to view a newspaper report of Swindon's 2-1 win against Exeter City in the 1930-1931 season. 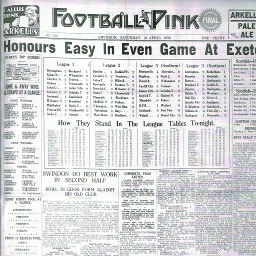 Click to view a newspaper report of Swindon's 1-3 defeat at Exeter City in the 1930-1931 season. 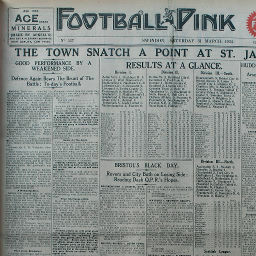 Click to view a newspaper report of Swindon's 1-1 draw at Exeter City in the 1931-1932 season. 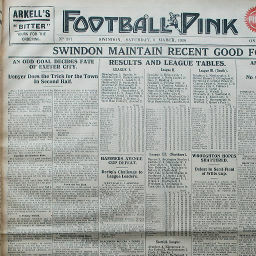 Click to view a newspaper report of Swindon's 2-1 win against Exeter City in the 1931-1932 season. 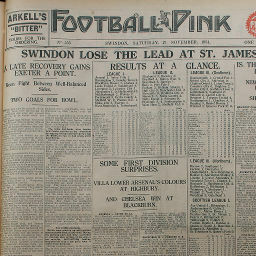 Click to view a newspaper report of Swindon's 1-1 draw against Exeter City in the 1933-1934 season. 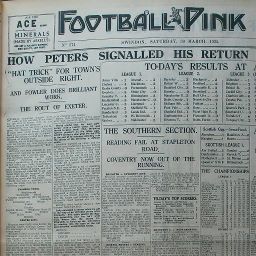 Click to view a newspaper report of Swindon's 2-2 draw at Exeter City in the 1933-1934 season. 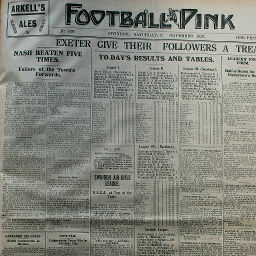 Click to view a newspaper report of Swindon's 3-3 draw at Exeter City in the 1934-1935 season. 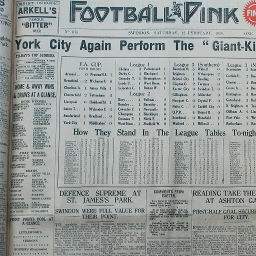 Click to view a newspaper report of Swindon's 6-1 win against Exeter City in the 1934-1935 season. 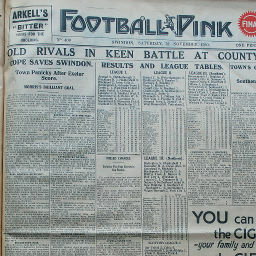 Click to view a newspaper report of Swindon's 1-1 draw against Exeter City in the 1935-1936 season. 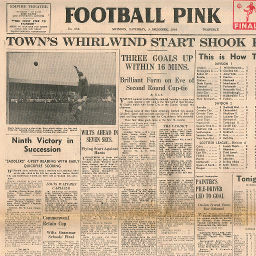 Click to view a newspaper report of Swindon's 3-0 win at Exeter City in the 1935-1936 season. 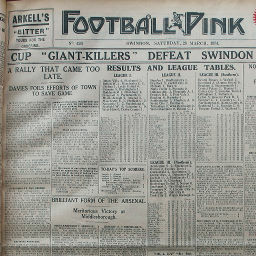 Click to view a newspaper report of Swindon's 3-1 win against Exeter City in the 1936-1937 season. 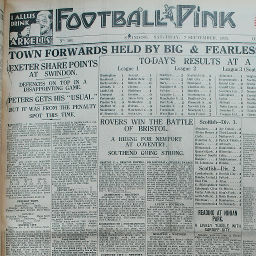 Click to view a newspaper report of Swindon's 1-1 draw at Exeter City in the 1936-1937 season. 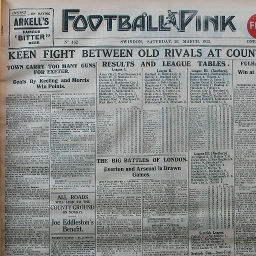 Click to view a newspaper report of Swindon's 3-0 win against Exeter City in the 1937-1938 season. 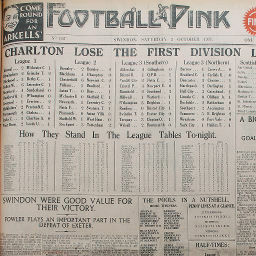 Click to view a newspaper report of Swindon's 0-0 draw at Exeter City in the 1937-1938 season. 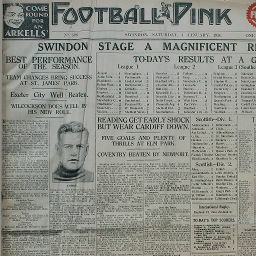 Click to view a newspaper report of Swindon's 2-1 win against Exeter City in the 1938-1939 season. 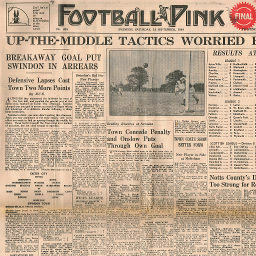 Click to view a newspaper report of Swindon's 0-0 draw at Exeter City in the 1938-1939 season. 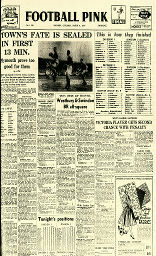 Click to view a newspaper report of Swindon's 2-0 win against Exeter City in the 1946-1947 season. 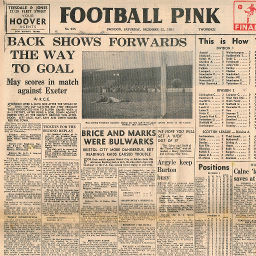 Click to view a newspaper report of Swindon's 1-1 draw at Exeter City in the 1946-1947 season. 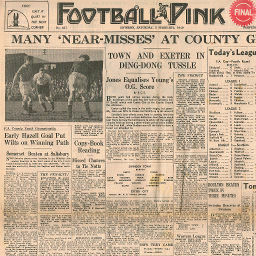 Click to view a newspaper report of Swindon's 1-2 defeat at Exeter City in the 1947-1948 season. 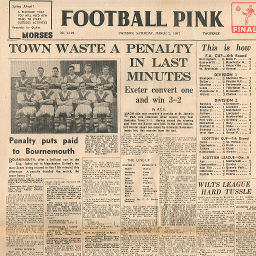 Click to view a newspaper report of Swindon's 1-3 defeat at Exeter City in the 1948-1949 season. 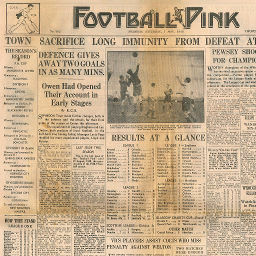 Click to view a newspaper report of Swindon's 1-1 draw against Exeter City in the 1948-1949 season. 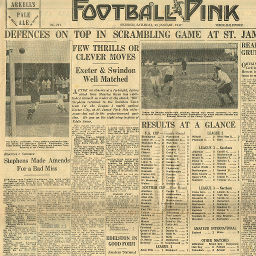 Click to view a newspaper report of Swindon's 7-1 win against Exeter City in the 1949-1950 season. 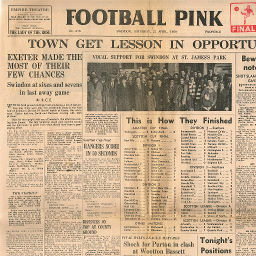 Click to view a newspaper report of Swindon's 0-3 defeat at Exeter City in the 1949-1950 season. 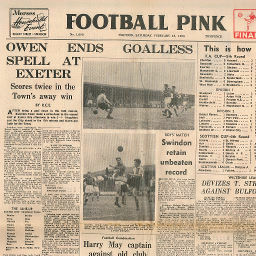 Click to view a newspaper report of Swindon's 0-3 defeat at Exeter City in the 1950-1951 season. 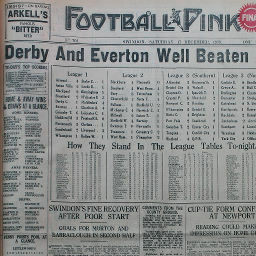 Click to view a newspaper report of Swindon's 3-1 win against Exeter City in the 1951-1952 season. 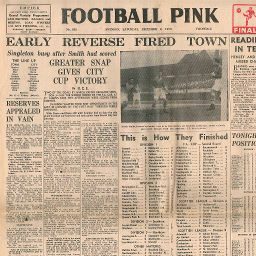 Click to view a newspaper report of Swindon's 5-2 win against Exeter City in the 1952-1953 season. 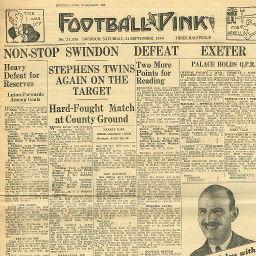 Click to view a newspaper report of Swindon's 0-1 defeat against Exeter City in the 1955-1956 season. 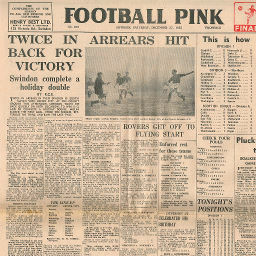 Click to view a newspaper report of Swindon's 2-1 win at Exeter City in the 1955-1956 season. 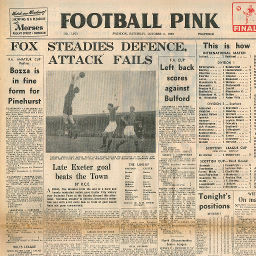 Click to view a newspaper report of Swindon's 3-5 defeat against Exeter City in the 1956-1957 season. 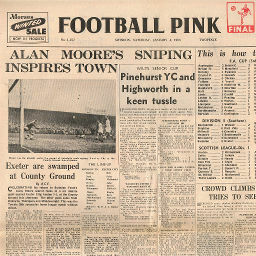 Click to view a newspaper report of Swindon's 2-3 defeat at Exeter City in the 1956-1957 season. Saturday, March 9, 1957 TOWN'S FATE IS SEALED IN FIRST 13 MIN. 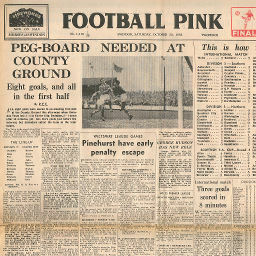 Click to view a newspaper report of Swindon's 5-1 win against Exeter City in the 1957-1958 season. 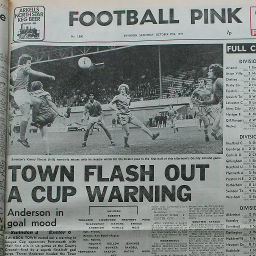 Click to view a newspaper report of Swindon's 4-0 win against Exeter City in the 1977-1978 season.